Houses had very little insulation and were not very air tight. Now, homes are well insulated and tightly sealed. Attic ventilation is needed for a comfortable home. Building codes usually require 1 square foot of ventilation for every 300 square feet of attic area, divided equally between intake and exhaust vents. This is simple arithmetic, no guesswork is involved. Both roof exhaust and soffit intake vents are needed. In the daytime, the sun beats on the roof and heats up the attic. Hot air rises and goes out the roof vents. It cannot get out unless it is replaced by cooler air coming in from the soffit vents. It is like sucking on a pop bottle compared to sucking on a straw. Without attic ventilation, summertime attic temperatures can exceed 160 F. Even at night the attic stays hot. 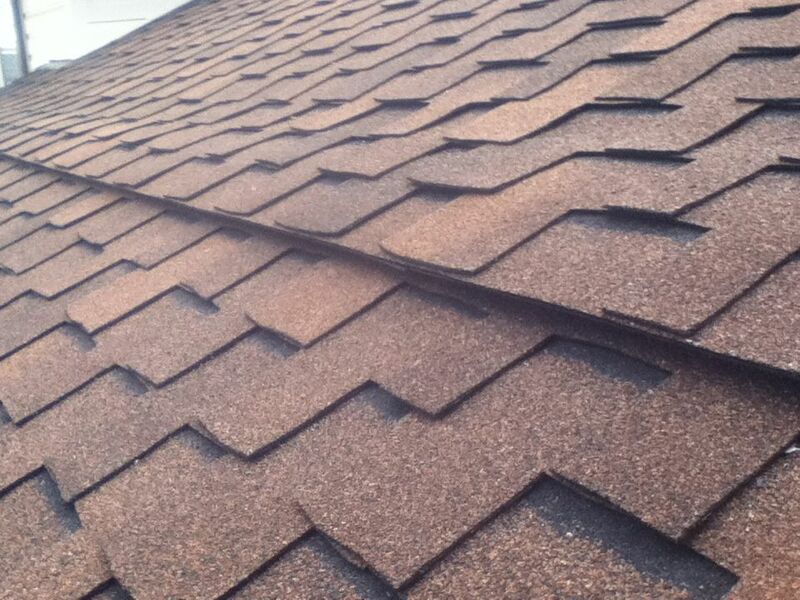 The excessive heat reduces the life of your roof and eventually penetrates to the living space of your home. A well ventilated attic will make your home noticeably cooler and reduce the load on your air conditioning. Attic ventilation removes moisture from your attic. Moisture in your attic can cause mold and mildew. Water vapor is produced from bathing, cooking and household appliances. This moist air rises through the attic until it contacts the cold underside of the roof, where it can condense into water droplets. It then can drip onto the insulation, reducing its efficiency. The water can cause mildew and mold, rot the wood, damage and spot ceilings and paint, and cause damage to the roofing. Also, ventilation helps prevent ice dams, which is especially important in Colorado. Ice and snow on a roof will melt and run down the roof to the cooler eaves, where it can freeze and create a dam, trapping moisture on the roof. Ventilation helps to prevent this by keeping the roof deck temperature consistent. How much ventilation do you have now? For a downloadable Excel spreadsheet click HERE. RV51 Roof vents are installed along the ridge of the roof. They have an insect screen and have 51 square inches of net-free area. are another option. Instead of an insect screen, they have closely spaced louver openings. 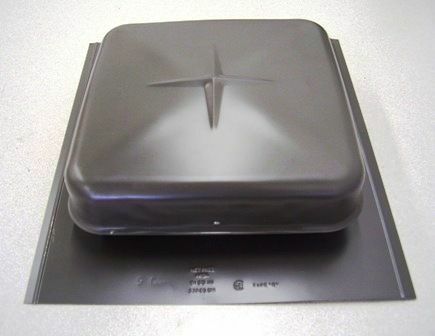 B-144 dome roof vents are larger, round vents. They look like an attic exhaust fan but they do not have a fan in them. They also have an insect screen and have 144 square inches of net-free area. They are available in weathered wood and brown and are made of steel. is installed along the ridge. Several designs are available. 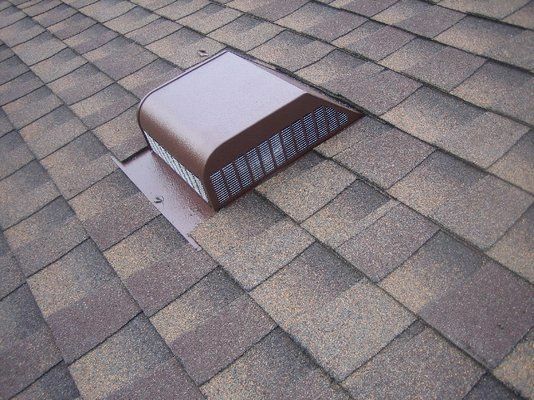 Roll ridge vent is the least expensive but can allow rain, snow, and debris to clog the vent. 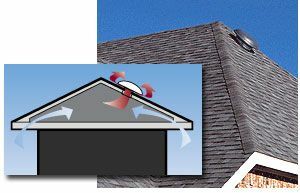 Baffled ridge vents direct the wind up and over the ridge to provide negative pressure and pull the hot air out of the attic. They also offer more protection from wind driven rain and snow. Net free area is from 12 to 18 si per foot. O'Hagin Low Profile Vents are very weathertight and look great. 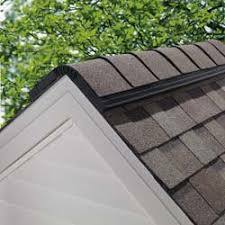 They can be installed on north and west facing slopes and can be installed low on the roof as intake vents. They are often installed on homes that do not have an overhanging soffit. 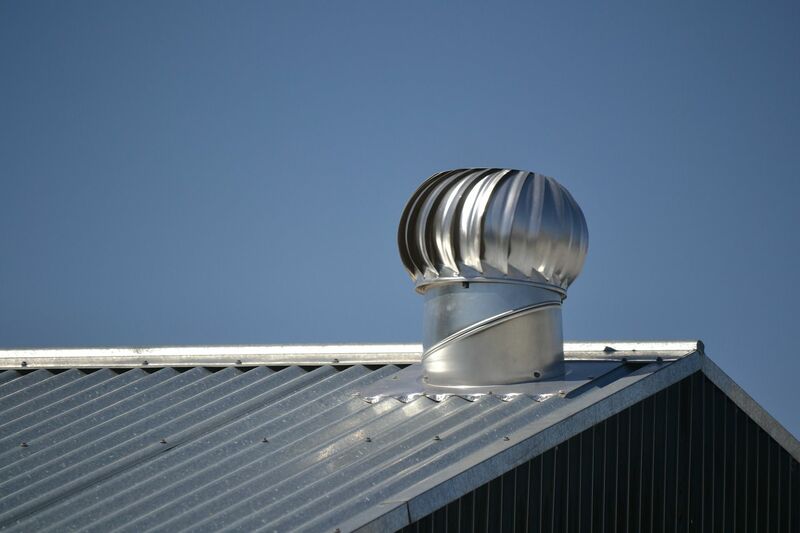 Turbine Vents have a rotating top that is turned by the wind or by the hot air flowing up through it. If the wind is blowing the spinning action of the blades can help pull hot air out of the attic. However, they have a moving part that will not last as long as the rest of the roof. And they need to spin or rain and snow can come in. Appearancewise they are best suited for barns. Rectangular soffit vents are inexpensive and very effective. 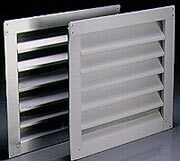 The are louvered with an insect screen and are available in several sizes. The colors are white, brown and galvanized. are usually 2" wide and run along the length of the soffit. They are mostly for new construction because they are difficult to install as a retrofit. It is next to impossible to clear any insulation out of the way. is used on homes that have little or no overhanging soffits. It is best installed when the roof is installed. A slot is cut along the edge of the roof and the vented drip edge needs to be sealed with the rest of the roof. 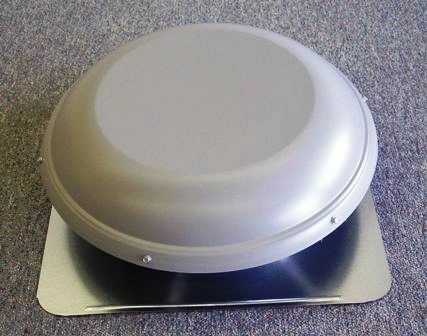 For homes with no soffit vents midroof intake vents can be used. They are like half of a ridgevent. Like vented drip edge, a slot is cut in the roof to allow air into the attic. The mid-roof vents are sealed with ice and water shield. 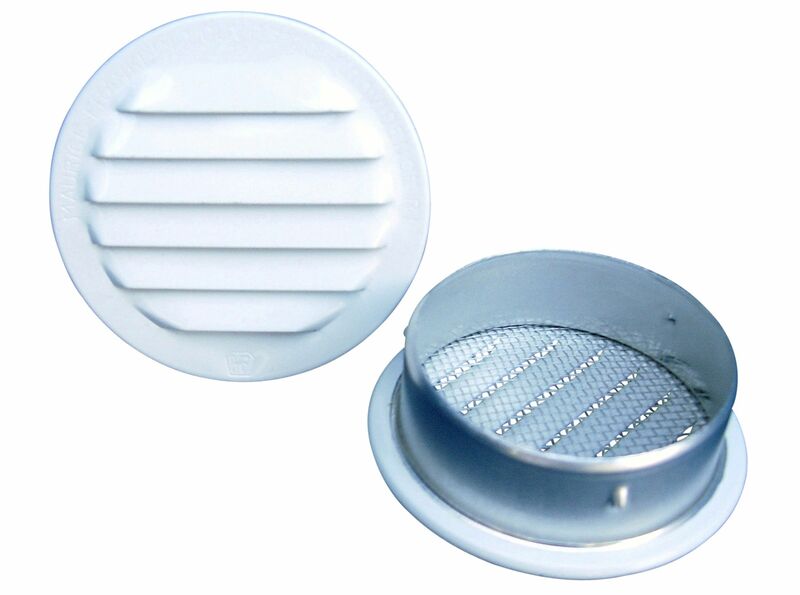 Small round vents, also called mini-vents or round louvers, are available in sizes from 1" to 6". 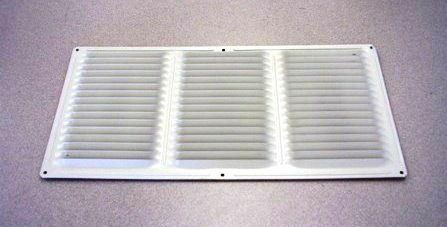 However, the amount of net-free area of these vents is so small that they are only used in special situations. Vent Masters stocks these vents in copper, plastic, aluminum and stainless steel in white, brown, black, and mill finish in sizes from 1" to 6"
are placed at the ends of the attics. They can function as either intake or exhaust vents depending on the direction of the wind and how high they are on the gable. They can be square, rectangular, triangle shaped, or round. Gable vents tend to short circuit the attic ventilation. They also can leak when the wind blows rain or snow into them. For most efficient ventilation, gable vents should be sealed in favor of only roof and soffit vents. are usually attached to a thermostat located in the attic. The thermostat can be set so that the fan starts when the temperature reaches a certain temperature, usually 105 F.
Solar powered attic exhaust fans run whenever the sun is shining. Unless they have a battery backup they do not run at night so you do not have ventilation when it is the coolest outside. Attic exhaust fans need intake ventilation. If there is not cool air entering the attic, the hot air cannot get out. Do not install an attic exhaust fan if you already have rooftop or gable vents. The fan will pull air in from the rooftop or gable vents, “short circuiting” the attic ventilation system. Attic ventilation systems are either powered or unpowered. If you install an attic exhaust fan you should plug any existing rooftop or gable vents and install more soffit vents. Rooftop fans are more powerful and are easier to install than gable fans. Solar powered fans do not require electricity but are not as powerful as electrical fans. If you have other roof or gable vents you should block them. Otherwise when the fan comes on it will pull in air from the nearby roof or gable vent instead of the soffit vents. Rooftop Exhaust Fans are also called powered roof ventilators or attic fans. They usually come in 3 sizes. Depending on the size of the fan, they may be available in gray, mill, or weathered wood. 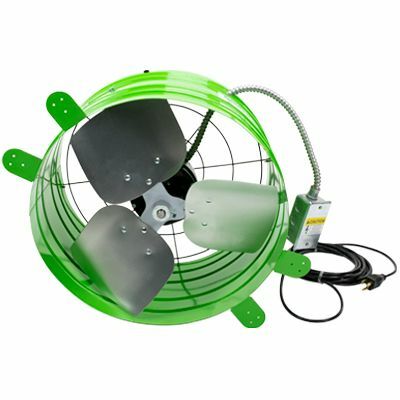 Gable Exhaust Fans are also generally available in 3 sizes. They are installed with automatic shutters that open when the fan comes on. NOTE: DO NOT INSTALL ONE BLOWING OUT A STANDARD GABLE VENT. The screen and louvers partially blocks the air. They should have a dedicated louver that opens fully when the fan comes on and closes completely when the fan turns off. Solar Powered Fans are cute. They are more expensive than regular electrical attic fans and they do not move as much air. They run whenever the sun is shining so no controls or wiring is needed. However, most models also shut off as soon as the sun goes down or it gets cloudy. That means you have very little ventilation going on late at night when it is cool and you want to cool off your home. Helping keep Colorado cool since 2003. Copyright	All rights reserved by Vent Masters.